If the people you kill are insignificant or even unpleasant do their deaths matter? I am not asking for myself. Mr William Bowling wonders about it, too, and when he starts killing buys newspapers to read about each murder, thinking about how close to arrest he is, but arrest never seems to come. You and I might think about turning ourselves in, or planting more clues pointing to us, but Mr Bowling prefers another approach: another murder. 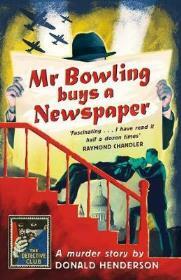 In Mr Bowling’s unhappy life one murder more or less makes little or no difference. It’s 1941 or 1942 and the Luftwaffe are bombing London: when, in one air raid, William and Ivy Bowling find themselves trapped under the masonry and Ivy will not or can not stop screaming, William stops her. He stops everyone thereafter the same way: he has a strangler’s hands. Odd, considering he is a very good pianist; perhaps throats can be measured in a reach of octaves. An unpleasant customer – William is an insurance agent until he receives Ivy’s life assurance pay-out and he is able to give up work – goes the same way; a dull neighbour in a block of flats; the concierge’s dubious husband: the only thing that changes is the effort that William has to make to move the body. The Civil Defence, after all, thought it likely that there would be bodies such as Ivy’s under a blitzed home, stumbling over a corpse on the communal stairs is more likely to summons the authorities, but Mr Bowling, who at one time seemed to have no interest at all in life (‘anhedonia’ I think it is called), finds himself capable of making such a change. In 1943 this was one of the books being talked about – in the USA Raymond Chandler marked it out for special praise as the sort of crime novel he wanted more of. In Britain George Orwell, then a BBC producer, thought it significant enough to send to his regular reviewer E. M. Forster. Forster’s opinion would be worth knowing, but he lost the book, leaving us forlorn. Orwell might have noticed one or two things if he did a quick scan before passing it on: the surname Bowling and the occupation in insurance both featured in his own 1939 novel, Coming Up For Air, while the two men’s wives, Ivy and Hilda, were not too far apart either. Donald Henderson had been a bit-part actor who had played in Patrick Hamilton’s Rope, among others, but Mr Bowling Buys A Newspaper has much more in common with Hamilton’s own novel Hangover Square, published in 1941 but set just before the War and again concerned with a solitary unhappy figure. Unlike Hangover Square, though, Henderson’s novel has a twist in the tale. It ends happily, which perhaps makes this not a black but a black-out comedy. This is another re-publication in the Detective Club series well worth the effort.